McDonald’s are celebrating the return of their highly anticipated Monopoly prize game with a tactical, digital OOH campaign. The UK-wide campaign encourages consumers to get “peely peely” for a chance to win, by reminding them how many prizes have already been claimed! Similarly, the second phase will also show the number of prizes that have been claimed – but at a regional level. Twenty UK cities were carefully selected and campaign copy was tailored. For example, “10,000 prizes already claimed in Birmingham,” alongside the same call to action. The campaign was produced by Grand Visual, with planning and buying by OMD and Talon. 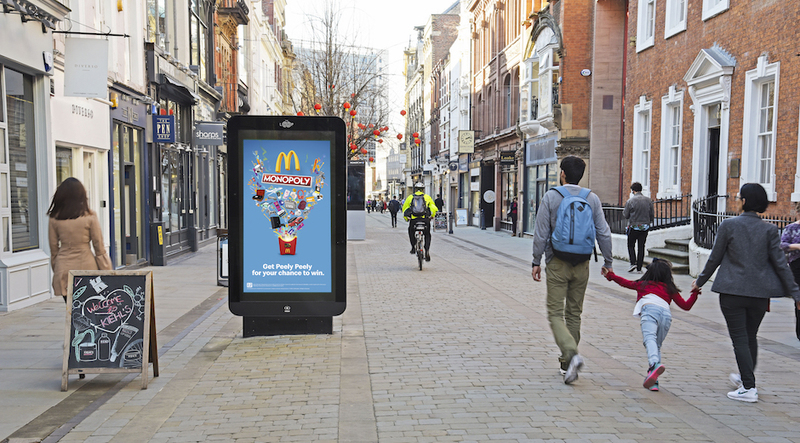 OpenLoop, the digital OOH campaign management platform from QDOT, takes the live prize data feed from McDonald’s and distributes relevant creative to Media Owners across the UK.